A few months ago, I was the lucky winner of a giveaway on Goodies For Mom. The prize I received was so amazing that I just had to make it my first ABOG Top Pick for Kids. There are many options out there for personalized children's books, but Peek Stories allows you do more than just add your child's name to the text. They also allow you to customize the appearance of the main character by choosing the gender, skin tone, eye color, as well as the hair color and style. The little guy shown below is the spitting image of my preschooler Jake. 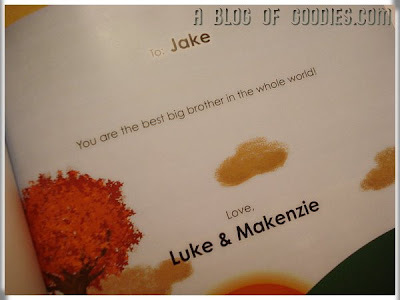 As another added touch, you can specify a dedication or gift message to be printed on one of the beginning pages. I decided to keep this book aside as a Christmas gift to Jake from his little brother and sister. Since they are only 20 months old, this was perfect because they cannot express themselves well on their own yet. I know Jake will cherish this book. A few other things you should know about Peeka Stories . . . There are 3 titles to choose from (A Great Day, Peeka You, and Colors). There are 3 packages available (1 book for $23.50, 2 books for $45.25, and all 3 books in a gift box for $78.50). Prices do not include shipping. The hardcover books include rhyming text and are beautifully illustrated. Individual books come in an envelope ready for gifting (as shown in the first photo). Gift certificates are available for purchase in the amounts of each package option plus the cost of shipping. Peeka Productions offers a money back guarantee. All featured vendors are welcome to display the ABOG Top Pick logo on their websites.